Some of the wider yogic techniques are taught in my workshops. Information about past workshops is posted here. Please get in touch if you would be interested in us running one of these again. Otherwise please see our Upcoming Workshops and Events Page for information about our future plans. Bermondsey Fayre, 212 Bermondsey Street, London SE1 3TB. 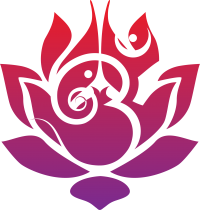 This 2 hour workshop combines mindful slow flowing movements, with peaceful restorative poses and finishes with yoga nidra (yogic sleep) – a deeply relaxing practice. Participants will go away with materials and techniques they can use regularly to help relax and de-stress. In this gentle and therapeutic workshop we’ll start with a few flowing movements to loosen up before we use props to support the body, encouraging deep relaxation. Using passive yoga asanas we let our nervous systems shift into a lower gear, and enjoy the benefit of true rest. Different from more active styles, we will concentrate on surrendering our weight to supports and softening into the stretches and into our breath. At the end of the workshop we will practice yoga nidra, yogic sleep – a state somewhere between consciousness and sleep – which is reached through a guided relaxation. Many people lead very busy, and stressful lives with constant deadlines and goals. Sometimes this competitiveness and goal seeking behaviour can enter the yoga space – with a focus on achieving the next pose or going into so called advanced poses – such as the more difficult arm balances. However, the true goal of yoga is to enter into a state of stillness and meditation, and the asana are a tool to enable us to have a healthy body to be able to sit comfortably in a meditative pose. We should keep this in mind in our approach to our yogic practices. Restorative yoga is a therapeutic style that helps us to relieve the effects of negative stress encountered in daily life. It can be highly beneficial in times of fatigue, illness, and emotional strain. Our focus will be to calm and nurture ourselves on all levels during the workshop. The conscious relaxation techniques taught can be used outside of the yoga room, and participants will go away with some tools and techniques they can use at home. Yoga nidra is a state somewhere between sleeping and waking. In this state the mind is relaxed and receptive, and it is possible to sew seeds of positive intention (known as a sankalpa in yogic teachings). It is practiced lying on the floor and the participants follow the instructors voice. We will provide mats, bolsters, blankets and participants are encouraged to bring an extra layer and warm socks. Sometimes this competitiveness and goal seeking behavior can enter the yoga space – with a focus on achieving the next pose or going into so called advanced poses – such as the more difficult arm balances. However, the true goal of yoga is to enter into a state of stillness and meditation, and the asana are a tool to enable us to have a healthy body to be able to sit comfortably in a meditative pose. We should keep this in mind in our approach to our yogic practices. At this unique workshop we’ll be celebrating the new moon and connecting with our deeper selves. In the first half, you will be guided through a physical yoga practice focusing on animal forms in yoga. 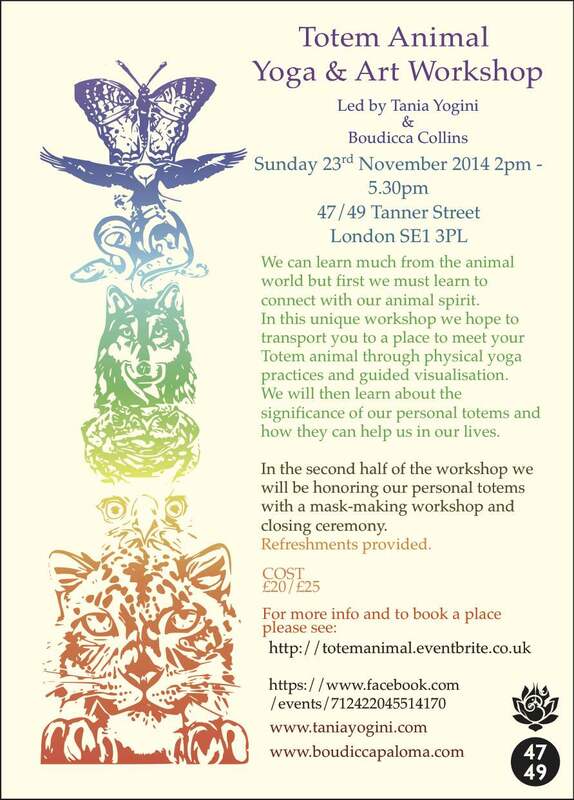 We will then compleat a meditation /visualisation practice that will enable you to find your own personal animal spirit / guide. After you have found your unique animal we will together honor the attributes of our personal Totems with a mask-making workshop and closing ceremony. Suitable for adults, this workshop intends to take you closer to the natural world, while having fun and creating a beautiful piece of artwork that you can take home with you. It is believed in shamanism that we can draw on the special qualities and abilities of animals to guide us and help us in our lives. In rituals, movement is often incorporated both to relax, but also to help align the individual with the energies and essence of certain animals. At this unique workshop we’ll be learning some of the secrets of the animal world, and participants will be guided to find their own unique animal totem. They will do this via a guided inner journey through a waterfall in the mind where their animal will appear to them. We’ll then learn about the role of animals as guides in shamanism, for example some animals are nurturers and protectors; others have great fertility and gentleness. Some embody strength and courage, and some can teach playfulness. Animals can help us recognise our own skills, and know when to use certain skills. For example owls have amazing hearing and when one appears in our lives it might mean that we need to listen carefully. ‘The animal world shows us the potential we can unfold. But to learn from them, we must first learn to speak with them.’ Ted Andrews, Animal Speak. This yoga, art and shamanism workshop will take place in a beatuful victorian warehouse close to London Bridge, Tower Hill or Bermondsey Tube stations.